A kids’ party these days can really put the pressure on the organiser to provide healthy food as an alternative to the traditional additive and fat-filled junk we all enjoyed at our own parties, way back when. There’s a balance to be made between nutrition and waste – the trick is to make your party food look as appealing, colourful and fun as possible. Try some of our ideas at your next bash. As hard as you might try to provide a healthy spread, the reality is your little guests will be expecting and will prefer traditional party food, probably because most of them eat healthy diets at home day in, day out. Making fruit kebabs and drizzling them or dipping them in melted chocolate will present the little darlings with a good injection of vitamins with a sweet incentive. This child-friendly way to provide fruit will hopefully mean you’ll have little left over. Homemade pizzas are easy to throw together and you can make a range of healthy toppings with just a small amount of low fat cheese. Try using round wholemeal pitta breads for your pizza bases, spread them with a little tomato or barbeque sauce and pile them with anything you like. Tuna, sweetcorn, pineapple, ham and chicken all make good low fat, low sugar pizza toppings. Serve them in slices so your guests can mix and match. Rolled wraps sliced up and served on a platter make great party bites for little mouths. Simply lay out your wrap and top with a slice of ham, salad and perhaps a spread of hummus; roll up and slice into bite-size portions. You can make a range of fillings and use both white and wholemeal wraps. Desserts are also an easy win. Try making your own fruit jellies using fruit juice and chopped up pineapple, grapes, strawberries and anything else you have to hand. 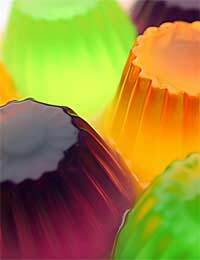 Your colourful, wobbly jellies will really appeal to kids, particularly if you can get hold of some fun jelly moulds to make them into different shapes. A party just isn’t a party without cake, but it can be hard to find a healthy cake recipe. Carrot cake is a good option, having a healthy dose of carrot and less sugar than your traditional party sponge. Serve in small slices or, for a better visual effect, make into iced cup cakes and display them in a cake stand. You could also try making a tea loaf, slicing it into fingers to serve. With home baking you can keep an eye on the amount of sugar and fat you’re using and you can often cut down one or the other without spoiling the taste. These ideas for healthy kids’ party food should ensure your guests leave full up and happy, and you shouldn’t have much leftover. The trick is to do everything you can to make your dishes look like traditional party food – don’t give away the fact that they’re packed with good things, rather than fat and sugar, and you won’t go far wrong!